The Red Sox announced a pair of promotions today. Right-handed pitcher Justin Haley has been promoted from High A Salem to the Double-A Portland Sea Dogs and fellow righty Jonathan Aro gets the call to Salem from Low A Greenville. A third right-hander, Ty Buttrey, has been activated from the disabled list by Greenville after completing a rehab assignment with Lowell. Haley, a sixth-round pick out of Cal State-Fresno in the 2012 draft, was named to the Carolina League All-Star team earlier this season for his strong work at Salem. Splitting time between the rotation and a piggyback role, Haley has a 2.82 ERA and 1.079 WHIP in 92 2/3 innings. He has taken a big step forward with his control in 2014. After walking 74 batters in 124 2/3 innings with Greenville last season, Haley has cut that number to only 23 this season. He is ranked the #38 prospect in the system by SoxProspects.com. Aro, the SoxProspects.com Pitcher of the Month in May, is in the midst of a second consecutive strong season. After posting a 2.14 ERA with Short Season-A Lowell in 2013, Aro hasn't missed a beat with a 2.27 mark in 67 1/3 innings for the Drive this year. He has served in a piggyback role for Greenville, throwing at least three innings in 15 of his 25 appearances out of the bullpen. Buttrey was given a $1.3 million bonus as a fourth rounder in the 2012 draft, but has had inconsistent results so far as a professional. In four starts with Greenville this season, he allowed 16 runs on 18 hits in only 11 1/3 innings before breaking his hand on May 18. 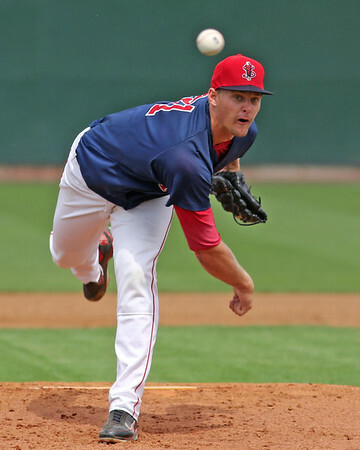 In five rehab appearances split between the GCL Red Sox and Lowell he had better results, giving up five earned runs on 13 hits in 16 2/3 innings, striking out 16. The 6-foot-6 right-hander will start tonight's game for the Drive.